Peter Spinner was born April 16, 1833, in Oberachern, Baden, Germany. He was the second of seven children of Anton Spinner and Clophe Spaeth. Peter’s ancestors can be traced directly to Franziskus Spinner (1675-1736), in Ramsbach, Germany. This and other early records were compiled and provided by Wilfried Spinner a Spinnerphile, currently living in Oberachern. There is no written record of Peter’s early life in Germany. He was from a family of some means and his immigration to America was most certainly the result of the prevailing military conscription. There is no proof that the suggestion that Peter arrived in Davenport, Iowa, in 1848, at age 15, and then moved to Village Creek in 1855 is valid. In 1853, approaching the age of 21, Peter became eligible for conscription and would have been required to do military service. There is documentation that Peter petitioned the courts to seek relief from military service and request travel papers to go to America. The amount of the fine required to avoid military service in Baden was based on the parent’s net worth at the time of the birth of the person requesting deferment. The courts estimated his father, Anton’s, net worth at Peter’s birth to be 1570 Guldens. That value was then divided by the number of Anton’s current dependents (10). His wife Clophe had died. Anton had remarried and he now had a second family. Peter’s share was 157 Guldens. The court determined Peter’s fine to be 57 Guldens leaving Peter 100 Guldens as his inheritance. In today’s currency a Gulden would be about $630. Hence Anton’s net worth at Peter’s birth was about $990,000. Peter’s fine would have been about $39,000 and Peter’s share, $63,000. It is quite likely that Anton had to sell property to finance the fine and it is not clear if Peter received the full amount of his inheritance. On August 24, 1853 Peter received his travel documents and was allowed to exit the Duchy of Baden. It is not known how Peter traveled to America, which ports he used, how long his journey, or exactly when. But in 1854, he was in Ohio and shortly thereafter in N.E. Iowa. It is most likely that Peter met his wife, Katharina Markt, in Ohio. She had arrived there with her family about 1853. In the 1850’s Iowa was encouraging pioneers and Peter was certainly aware of these opportunities. Peter selected to settle in Milton, a beginning community on Village Creek then a navigable Mississippi tributary several miles south of Lansing, Iowa. The Illustrated Historical Atlas of the State of Iowa (1875) listed Peter in 1856 as a blacksmith in Milton (plated-1854) but residing in the adjacent community of Village Creek (plated-1857). Along with neighboring Howard (plated-1857) the three pioneer communities joined together. Village Creek became the surviving name as it contained the Post Office. 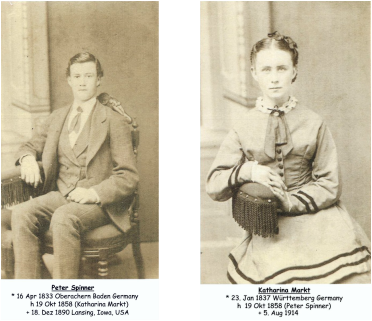 In 1858 Peter returned to Marion, Ohio and married Katharina Markt. They returned to Village Creek where Peter resumed his blacksmith career. Peter’s younger brother, Barnhart, had accompanied Peter to America. At age 18, Barnhart did not yet qualify for conscription thereby avoiding fines and special exit visas. He stayed in Village Creek with Peter and Katharina and learned the blacksmith trade from his brother. 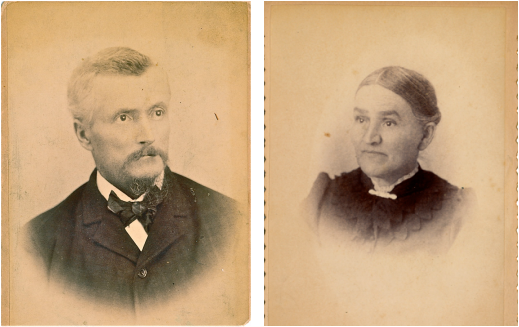 In 1865 he married Mary Elizabeth Goodwater in Waukon and began a career in farming. The couple eventually moved to Ossian, Iowa, where they continued to farm while raising 16 children. Barnhart died in 1920. Peter and Katharina had 8 children—6 boys and 2 girls. One girl died at age 1 and is buried in the Village Creek Cemetery. With six growing sons to assist, Peter purchased several tracts of raw land which they cleared, fenced and improved. He continued farming and blacksmithing until his death in Village Creek in 1890 at age 57. He was buried in St. Joseph Cemetery (Paint Rock) in Harpers Ferry. A procession of 108 teams “escorted his remains to Paint Rock Cemetery testifying to the esteem in which he was held as friend and neighbor”. Peter’s remains were later moved to Gethsemane Cemetery in Lansing where his wife and 6 of his 8 children were eventually interned. Katharina Markt Spinner lived another 24 years. She died in her daughter’s home in Lansing in 1914.